"Innovative Agro Industry PNG is working with both public sector and private sector partners to develop sustainable commercial agriculture projects throughout PNG that create avenues for meaningful participation for local communities." Farmers from the Kairuku-Hiri District will be the recipients of a donation of tools from Brian Bell for the purpose of maize production for Ilimo Dairy. Some villages in the District have been involved with the maize out-grower farming pilot project since last year, a project designed to provide feed to the Ilimo Dairy herd while creating cash cropping opportunities for local farmers . 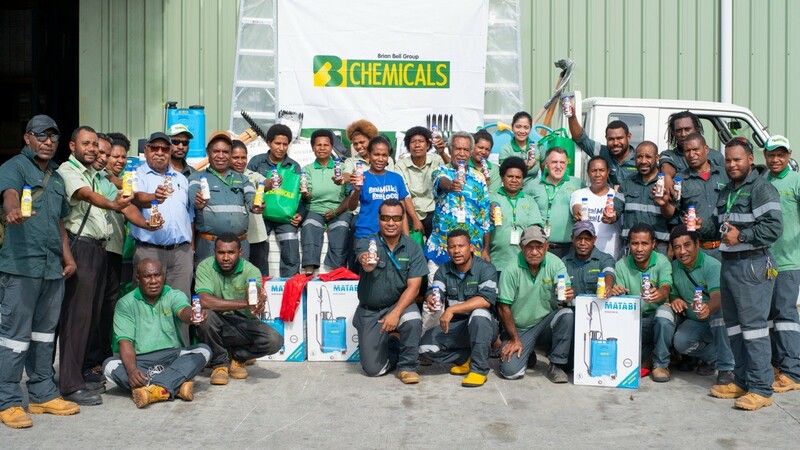 IAI Business Development Manager Gallit Tamir said “ We are grateful for partners such as Brian Bell for coming on board to support the Kairuku-Hiri maize farming community with his generous donation of tools and fertilizers. On behalf of Ilimo Dairy and the maize farmers involved in our program I want to say thank you ”. Ilimo Dairy has been working closely with partners at the Central Province Administration to provide seeds and advice to local farmers currently engaged in a maize out-grower pilot program. The dairy is a partnership between operators agri business Firm Innovative Agro Industry PNG, Kumul Agriculture, and the people of Central Province. Speaking at this mornings presentation which occurred at the Brian Bell premises at Gordons, Divisional Manager of Brian Bell Chemicals David Slape said Brian Bell is a company with a big heart, often supporting community initiatives. When he was approached with the opportunity to support local farmers to participate in the Ilimo Dairy Maize Farmers program, he knew it was a great program for Brian Bell to support. Ilimo Dairy has been working with Central Province Women in Agriculture (CPWA) to ensure proper advice is given to the 500 local farmers who currently grow maize for the dairy farm. CPWA representative Mary Apa has been coordinating the program, liaising between the office of Member for Kairuku-Hiri Peter Isoaimo, MP, Central Province Agriculture, and Ilimo Dairy Farm. Mary was on hand to receive the generous donation. She thanked Brian Bell for the donation, and acknowledged the ongoing support of Ilimo Dairy and the member for Kairuku-Hiri, Peter Isoaimo, MP and his hard working District staff in bringing this important cash cropping opportunity to Kairuku-Hiri Farmers. Innovative Agro Industry PNG is working with both public sector and private sector partners to develop sustainable commercial agriculture projects throughout PNG that create avenues for meaningful participation for local communities.